Because you should always come first. First things first, I’m going to say this, and I want you to really register my message — you are loved. You are accepted. You belong. You are doing exactly what you’re meant to be doing at this moment. You are a precious, irreplaceable human being. I promise, a whole lot of people (including me, and hopefully including yourself), really, really like you! You deserve endless health, happiness, and success. You are worth the world, the stars, the sun, and beyond! 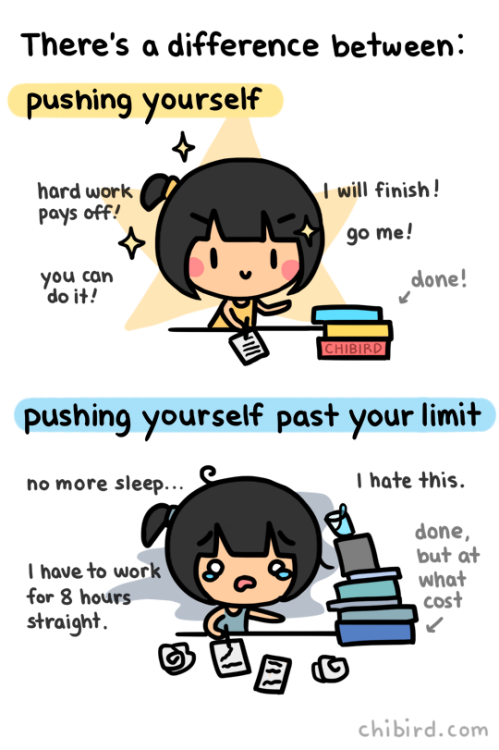 So… Why are you pushing yourself past your limit so much? I’m a college student myself, and obviously I’ve been through high school. I know what it feels, and looks like, to drag yourself to class either nodding off through the entire lecture, or even about to have a full-blown panic attack. Sometimes it feels like the weight of the world is on our shoulders. I deal with anxiety myself (along with 40 million American adults between the ages of 18 and 54 — a lot of us are in the same boat), and a valuable lesson that I’ve learned is that a lot of the time, a break is truly necessary to protect our energy, mental well-being, and overall success. Our society is out of balance, and we need to take more time to focus on ourselves. You are allowed a break if you need it — it doesn’t matter if you have an essay due or a test the next day. There’s nothing that can occur over the course of 24 hours in your everyday life that is more important than your own health. If you need a day to relax, you need a day to relax. The world will still be spinning when you’re done. The point isn’t that you should completely disregard your responsibilities such as work and school, as this too would be out of balance. However, recovery and self-care are equally important. A mental health day is an opportunity to rejuvenate, regroup, and remained balanced. All in all, it’s to remind yourself that you’re not alive simply to push yourself past your breaking point — you’re alive to exist and be happy. If anything, although your stressors will still be there when you return to the real world, you’re more prepared to face and conquer them once you’re relaxed and rested. The best part? There’s no rules to a mental health day! You can wake up at noon if you want, or 5 a.m. — whatever helps you feel better. Drink some tea, water, coffee, whatever you feel like. Meditate, if that’s your thing. Watch Netflix, go for a run, dance, bake, do some yoga, make yourself a snack, sing, watch some YouTube, or just sleep. You just do what you enjoy. After that, I promise from my own experience, you’ll feel stronger and more ready to take on whatever the world throws are you. Worst comes to worst, you’ll have some makeup work to deal with. Like I said, you’ll be more ready to do that work after your break. You’ll feel refreshed and have a more optimistic outlook if you take the time to take care of yourself first. So next time you find yourself chugging a Monster Energy at midnight in your best efforts to finish an essay (like I said, totally been there), consider taking the next day for you — you are 100 percent worth it. Now my lovely friend, I truly hope this helped you, and I hope you believe in you as much as I do; there’s not a doubt in my mind that you can handle anything that crosses your path, but also that you deserve a break every once in a while. Take care of yourself, and as always, know your worth.